KRVIA MASTERS: STUDIO II: URBAN DESIGN/ URBAN CONSERVATION. The pre-industrial cities are rapidly transforming itself into a large urban agglomeration. This cities are often developed without direction or development guidelines. 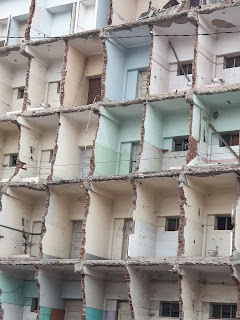 This kind of haphazard transformation is rapidly seen in most of cities across India. These cities are characteristically evolved with humane scale, contextualized typologies, walk-abilities, compactness and appropriate living and working relationships. These cities also offers lesson to basic urban design leanings in terms of formal and informal togetherness, bazaar conditions, community living, cultural conditions & social homogeneity. These conditions are very important to urban learning. The studio aims to decode these complex web of interrelationships and allow strategic interventions for transformation through housing in Jodhpur. The four areas studied through field trips, namely: Infrastructure, Tourism, Housing, Community. These parameter may not be mutually exclusive but complex enough to study such conditions. The intent of this studio was to derive an operative methods for improving the housing scenario in the inner city area of Jodhpur, through the area of study. It was explicitly revealing that typological system that exist in such cities are product of far more complex systems and conditions, The methods perhaps are limited for the academics exploration but systems need to explore beyond the conventional norms.